Lockers Room odors are the result of perspiration which is excreted by the sweat glands in our skin. Sweat itself is not the source of the odor, but rather the off-gassing of the bacteria which feeds on sweat. The source of this unpleasant off-gassing can be found on occupants, clothes,towels and equipment as well as other soft materials. Sanuvox Technologies’S300FX-GX UV/ HEPA System is the ideal solution to reduce & elimitate unpleasant odors such as locker room and lavatory odors. The proprietary Sanuvox process will sterilize and oxidize bacteria, viruses, chemicals and odors dramatically improving the air quality in these sensitive applications. OBJECTIVE: Reduce odors resulting from perspiration and sweat in locker rooms by killing bacteria and decreasing VOC chemical concentrations to achieve better air quality. Stand-alone: Model P900 equipped with a blower of 80 cfm; Model S300 with a blower of 300 cfm or Model S1000 with a blower of 1000 cfm. Filters (except P900) to capture particulates, (pet hair, etc.) and a dual zone UVC/UVV “adjustable” lamp are standard. The S300 unit can be used as stand-alone system with optional intake and exhaust louvers or ducted using an 8-inch flexible duct with optional collars. filtered and then exhausted. Recirculating the air in the room continuously reduces bacteria and odors, improving overall air quality. Approximately 6 to 8 air changes per hour are required. A P900-GX SP unit (80 cfm) w/ a dual zone UVC/UVV lamp will be required for a 1,200 cu ft room, (15’ X 10’ X 8’). 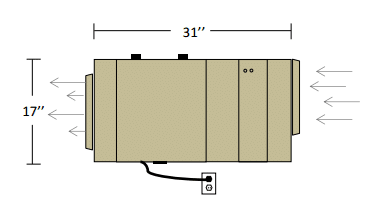 An S300FX-GX unit (300 cfm) w/ a dual zone UVC/UVV lamp will be required for a 4,500 cu ft room, (25’ X 20’ X 10’). Collars (MSCCOL1) can be ordered to duct the unit using an 8 inch diameter duct, or an intake and exhaust louver grill(s) (MSCLOU1) can be ordered if the unit will be used as a stand-alone system. An S1000FX-GX unit (1000 cfm) w/ a dual zone UVC/UVV lamp will be required for a 15,000 cu ft. room, (50’ X 20’ X 15’). The system uses 2 x 8 inch inlets and 2 x 8 inch exhaust outlets (collars). Unit should be positioned near the center of the room to be as effective as possible. Excluding the P900GX unit, all other units can be installed in the plenum above the ceiling or in an adjoining room and ducted with 8 inch round duct. section of oxidation, with the installer making the final odor adjustments on the job site. For more details on any of these units or their operation, please contact your Sanuvox representative. dressing room, fitness centers, etc.